A summer piece, done just for the fun of it! The figure was done in Poser®. 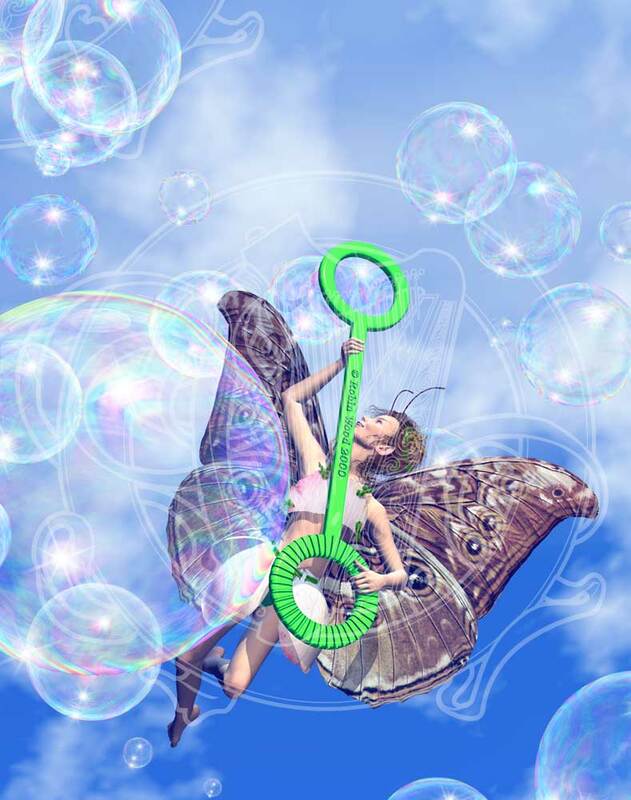 (The pixie is DAZ Victoria (although it was Zygote at the time,) and I made the wings, bubble wand and bubbles. Then I brought it into Bryce™ for rendering, and then into Photoshop® for the post-production work. A number of people have asked how I did the bubbles. Now, understand this was done years ago. But if you want to see how I did it back then, there's a tutorial in the General 3D section. The best part of doing this one was the research. I had to blow a lot of bubbles to carefully examine them and see just what they looked like! My cat Blue decided that she was afraid of bubbles. Purr remained uncertain on the whole topic. Then I had to take the bubbles outdoors into the sun, of course. Mourning doves don't like bubbles at all. Most of the other birds don't care. And they make dogs bark. A lot. We still have 3 of these available in the signed edition. If you want it, order it soon. When those are sold out, I'm going to remove the buttons at the bottom of this page, and the signed prints will no longer be available.